Here’s a beautiful project to get your new month started! 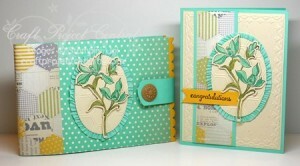 This mini album, which was made with the Envelope Punch Board, has three, 2-page layouts. It also has three, pull-out, pages that can be used for journaling or more pictures. Along with the matching card, this would make a wonderful gift for any occasion. It would also make a great scrapbooking class. This beautiful project was designed by Christy! If you have a chance please head on over to Craft Project Central and leave Christy a comment on her project!